Finally a Feat of strength for this mount. It looks like this achievement will also grant you title of The Camel-Hoarder. I'm just curious. Why a FoS and a new title for obtaining this mount, but nothing at all for PSD or TLPD? The Grey Camel is a ground mount and thus is a bit useless in this expansion, since there is almost nowhere a ground mount would be used over a flying mount. Wondering.. Is this mount still and tittle still obtainable in patch 4.1? I've been flying around for the last 3 months around 3hours per day and only found 1 fake camel at 5:00 o'clock wow time at neferset -.- If you go for this, understand that you can NEVER understand the number of people searching at the same time. If you just type /who u will miss the twinks that actually hunt this at the moment + all the people in the opposite faction. I got many things that require a waste of time in the game. My main is the insane + has hero of shatrath. But this... I gave up. I hope you have more luck than me! 1. You log in, and get the notice for a server restart in 15:00. 2. You're patrolling the spawn points in Uldum as usual. 3. NPCScan goes off. Found Mysterious Camel Figurine! "Cool, another dud", you think. 4. You check the NPC#, and it's 50409! Heart now leaps into throat. 5. You race around frantically, trying to find this tiny thing. For some reason /tar mys and NPCScan are not targeting it, so you're having to locate it visually. The server restart messages mock you with each passing minute. 7. Seconds turn into an eternity as the screen dims and the progress bar on the loading screen slowly inches across. 8. Like a bat out of hell, you race towards Dormus the Camel-Hoarder in the distance, blowing every single cooldown you have, your hands shaking. 10. You down him, loot Reins of the Grey Riding Camel, and watch the feat of strength ding on your screen as you sit back and think, "Did that really just happen?" 11. With 2:45 before restart, hearth and post in trade chat exuberantly (you know you would!). 12. Watch the video clip you, thankfully, had the presence of mind to take. For those that use TomTom. I made a list of Waypoints you can use to help find the Mysterious Camel Figurine, NPC #50409. Put it into 3 macros then just run all three and follow the way points. Good luck in your mount hunt! Got this achievement this morning while mining on my war, npc scan went off so I quickly logged my lock and flew like a bat out of hell to the spawn and thankfully it was still there. Just a note the statues are no longer targetable so to see them press CTRL+V and the name plate will pop up making it much easyer to locate. Just got this today. I had been looking for the camel figurines passively for a while, probably spent an hour total on it at most and found my first one today. I click it and lo and behold I'm swept up in a cyclone and whisked away to my grey riding camel! On my first try! This makes up for running Stratholm about 6 trillion times and never getting the Baron's steed. -When you find the wrong one do not clear your cache so you don't have any false "omg i found it!" to just be disappointed. -They can not be target via macro or _NPCScan, Shift+V didn't work (for me) either...it seems blizzard removed all "easy" ways to find this guy. Just stay calm and start looking for the tiny green (friendly) camel. -The boss dies rather easy and barely does any damage even on a cloth wearing (which i am). The boss will melee with Camel Smash which appeared to have a cast time and hit for roughly 10k on cloth, it was easy to run out of range and had plunty of time to do it. Dormus will also use Spit which makes a small aoe pool on the ground that ticks for roughly 1k damage. Dormus' Rage, the debuff you get upon being first teleported does expires in real time. the "trick" with logging out then coming back to try and get a friend the mount is no longer possible. Dormus takes more then 20 minutes to respawn and the debuff only lasts 20 minutes. I tried. Good luck on your hunting! I had the statues entered into Npc-scan, and got this title recently. and I really didnt know how many statues crumble to dust, so it does come down to luck. and I agree with Celathien, I have better mounts that didn't come with Titles and Feats. 50409: Gives you Sandstorm and teleport you to Dormus the Camel-Hoarder in Feralas that drops Reins of the Grey Riding Camel. 50410: Gives you Crumbled Statue Remnants. Looting Reins of the Grey Riding Camel will earn you a feath of strength Scourer of the Eternal Sands + Title: < Name > "the Camel-Hoarder"
Saw someone riding this today and thought I'd head down to Uldum to check for the figurine. Npcscan went off and I searched around for the tiny camel. Once I found it I clicked on it and I was transported on my first try :) Although I have to admit I feel as if I cheated because of the title's name. anyone know what the spawn time is for the figurines? Got this on my 2nd camel pick up! Good luck! Finally got my mount after 8 fakes and some hours of flying around in Uldum, found the 51409 at like 48,45 cords! YAY! Got it 24/07/2011 uhmmmm... Like this and 21 Mysterious Camel Figurine and 2 mounth. Camel Hoarder, Reins of the Raven Lord, Azure Drake, Time-lost Proto Drake and Fox Kit ... all in 5 days. I might be luckiest guy playing this game....and I mean it, its scary. There must be something wrong, i'm traveling trough the DarkElfIT waypoints for almost 3 hours with NPC Scan activated and haven't found a single figurine, neither 50409 nor 50410..
After a few months of making a effort to fly about looking for this with both NPC scan and silverdragon addon's I managed to be a pretty lucky buggar ... 3 fakes. and today i got the real deal on Dath'remar/Oceanic. As a hunter he's rather easy to deal with, Just send pet in and move outta the pool things he spawns under or about you. I used my Corehound to tank him. was down less than 2 mins. (And I was lvl85). just be dedicated to look each day at least and think positive. I just got mine today while i was doing archaeology in an area around Neferset. I was so excited when my npc scan went off but since these are not targetable anymore i mounted up and was freaking out while i was riding around trying to find it. Finally i found it, when i activated the camel i was immediately teleported to Dormus. I myself am a frost dk so he was quite easy to solo without even breaking a sweat. only had 217k. Good hunting to you all! Interestingly, you do not receive this Feat of Strength until you LEARN the Grey Camel. Haha, haters gonna hate. Be moar jealous plz. Are the camels target-able at all right now? This is very strange, I just decided to look up how people get this title and found this all this info. Well I've had NPC Scan for quite some time, and I'm always in Uldum because I'm an herbalist on one toon, miner on the other. The point of this post? I've never had NPC Scan alert me in Uldum once. I did a double check to see that this guy was listed on my rares page, and sure enough it's on there. I guess it's all timing, it just seems odd that I've need had an alert for this camel figure thing. I know some people find the "I found it after X fakes and after X amount of time!" posts annoying. However I find these posts very heartening. Whenever I am in the depths of a grind, or a camp, I can always come to wowhead, look at the comments, and be heartened by the fact that I could get it at any time. I can come and find a goal number. A number. A number to shoot for. so I say this to all the people who post their time spent and their fakes: Thank you. Edit: Spelling and things that did not make sense. Confirmed in 5.0.4 that NPCscan can still target these. Found the 50409 figurine last night, after three duds. It was at the Obelisk of the Stars spawnpoint (64.7, 30.4) - right corner of the obelisk's south side. Was out in Storm Peaks, camping for the TLPD (and watching It's Always Sunny in Philadelphia) when I saw the usual message for the weekly server reset. It was pretty late, almost 2am local time, so I spent a few moments thinking whether it was worth doing a round of Uldum before hitting bed. 'Ah, what the hell...' I thought to myself and hearthed back to Dalaran, ported to Stormwind and then again to Uldum. Without additional speed boosts, the fast flying mount can do my route in about 9 to 10 minutes, so it seemed just enough. I start the search over the west spawnpoints first, the whole route unfolding in an anti-clockwise direction. A few minutes later I'm at the final checkpoint which was (you guessed it) Obelisk of the Stars! Sleepy as I was, got quite the scare hearing NPCScan go off, but I tried to focus and swooped down on the spot indicated by GatherMate, where figurines are considered to be treasure nodes. These two addons make a great pair to use for figurine hunting since you don't have to search frantically for it, all it takes is landing inside the purple circle on the minimap. So keep trying everyone, one day (or night, in my case) it's going to be yours too! I found the real camel figurine today i just wanted to give my rant about how i did it. towards the end sunday/monday i was on the verge of giving up as i hadn't found any figurines in 2 days even though i was checking uldum hourly on 4 different servers Cael, Jubei, Dath and Frostmourne also due working nightshift i was able to check at 12am on Sat/Sun/Mon/Tues. it was pretty surreal as i'd assume it was the fake one but I was pleasantly suprised. Cylark on Wowhead posted this amazing tip for getting Mysterious Camel Figurines. All credit goes to him/her. I ended up finding more Figurines this way including my eventual real one. You need Gathermate 2 and Gathermate 2 Data. This will place every single Figurine spawn point on your map. If you use Gathermate2 I've entered in all the camel spawn locations so you can import them via the Gathermate2_Data addon. 3.) Select Merge, Be sure Treasure Data is checked, and hit the Import GatherMate2Data button. Curious question, does NPC scan still trigger of Camel figurines ? I was mining tonight on my freshly made Monk and lo and behold...! My _NPC Scan is yelling at me! Two nights ago I bagged the Time-Lost Proto Drake after four years of camping. I flew down and searched the ground for the idol and upon clicking it, I was ported. I was absolutely floored. Two exceptionally rare spawns not two days apart? Well okay, I'll take it! Thanks for rewarding my patience, Blizzard. If you really want this mount, don't stop trying. I got it after 20 fake statues and 6 weeks of searching every now and then on TWO low pop german servers with alts. Yea I cheesed it, props to anyone that can manage to get this mount on a high pop battlegroup such as misery which is where I have my main. Hey where can I find the camel figurine? Have looked after it for forever . Can someone help me? - TomTom is amazing for the search! It's a pain to look at screenshot'ed maps, look at yours, fly roughly to the location, compare the maps again etc. This addon adds dots and arrows for you. - NPC Scan (some use Silverdragon instead) is another one and you dont have to search as much with your eyes (it will go off when there's one close but it will not show you the exact location). - You have to find an item called Mysterious Camel Figurine in Uldum. It's a tiny camel you click. It will contain a grey item worth 25g -OR- it will do what you're after; send you off in a cyclone and take you to Feralas. Once there, you have to find and kill Dormus within 20 mins. You can not go to Feralas yourself and kill him, you have to find that little camel and be transported to Feralas. - When he's dead, you loot the mount and you will be given the achievement and title. - Have patience! These little camels are quite rare and over 90% of them will contain a grey item. I've heard they also respawn after 6-12 hrs. "/npcscan add 50409 Mysterious Camel Figurine" , it will trigger the camels that will move you to Feralas. "/npcscan add 50410 Mysterious Camel Figurine" , it will trigger the camels that will drop the grey item. Remember that you have to clear the cache once you've found a camel or the addon wont go off again for that item. To do so, logout of game, go to your WoW folder, then "Cache", then "WDB", then "enGB", then delete the file called "creaturecache.wdb" (search for that file if you cant be arsed to go via all the folders). When it's deleted, you can login again and continue your search. - TomTom: Create 5 macros (write "/macro" in your chat and create a new macro). Add the text saying /way and numbers below. When it's done, drag the 5 macro icons to your action bars and click on them when you are in Uldum. You should now have dots on your map, arrows on your minimap and an arrow on the screen showing you the direction. The dots will disappear once you've been at them. Click on the macros again to "resummon" the dots on the map. Unlike most extremely rare mounts such as TLPD or Phosphorescent Stone Drake, in which time between sightings can be days or weeks; giving you plenty of downtime after a confirmed sighting to delete your cache for NPC Scan, and come back at a later date, this mount can be farmed in 6 hours or less (typically much less) without the need to actually scourer Uldum endlessly for days/weeks/months! In addition to installing the standard NPC Scan and TomTom waypoints which help but leave you spending 95% of your time flying around only to find nothing, there's 2 very important tools to greatly speed up and reduce RNG to this feat of strength. http://msdn.microsoft.com/en-us/library/aa383614%28v=vs.85%29.aspx for help setting up Windows Task Scheduler. To locate and run Windows Task Scheduler, simply go to Start -> Programs -> Accessibility -> System Tools -> Scheduled Tasks. Using the add-on OQ you can instantly get invited to a party with people from nearly every server in the game, and when you do this, you will be transfered from your home server in which you've already checked all the waypoints for camel figurines, to a different server with a completely fresh set of camel figurine spawns to go and find! There's multiple ways to utilize OQ to your advantage to change servers for fresh spawns over and over. 1.) You can simply request an invite for absolutely anything listed on OQ and get instantly cross-realm transfered, but can be a little rude since you'll be leaving their party for another one shortly after checking all the camel figurines on that server. 2.) (For those running this completely solo) You can open 2 instances of WoW using either a 2nd account or a free trial account and have the 2nd or trial account create a new toon on different servers and use OQ to invite your main toon to a different server. 3.) Having a friend make toons on different servers and repeatedly invite you over and over to keep changing servers. Using a combination of Windows Task Scheduler, OQ or BattleTag cross-realm party invites, NPC Scan, and TomTom, you can simply make 1 loop around Uldum grabbing any camel figures, and when youve made 1 full loop finding any or finding none, you can instantly change yourself to a different server with fresh spawns and repeat the process again. When you get used to it, you can check all figurines in roughly 5minutes, change servers yourself and skip deleting your Cache File, and check a new set of figurines within another 5minutes, and endlessly repeat until youve finally been teleported to Dormus. 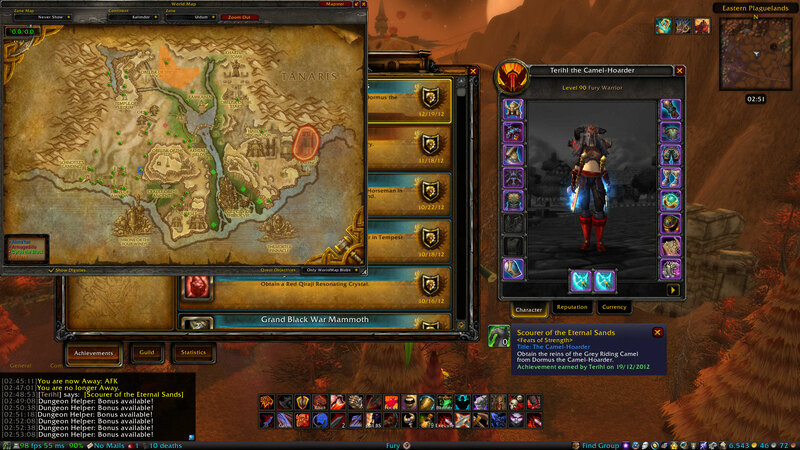 Using this method, I began my search at 8pm server, and by 10:30pm I had my mount, title, and feat of strength! And this was not pure luck or RNG, within those 2 and a half hours, I had searched through roughly 30 figurines before getting teleported to Dormus. Remember to set Shift+V. It is extremely helpful when trying to find the little thing when npcscan goes off. Happy Hunting! Control must be maintained. There must always be... *thunder*... A Camel-Hoarder. I suggest once u get one to return every 12 hours. I have never see one. Not that I have tried 100s of times but npcscan has yet to go off. I guess I will just do something that is not hoarding.. I have been looking for this guy off and on since I was leveling in Uldum and I have yet to even find ONE of the little camels. Im not complaining of course, not like it would make them spawn, but im wondering if there is a smaller radius on these that NPCscan just needs. Do I need to be really close to them for it to set the alarm off or am i just that unlucky? If you do find a Mysterious Camel Figurine be sure to post in /1 General to let other hunters know that one has been found. But your hunt does not stop there! You can realm hop to another server to get the statues over there. But it will only work if the realm you hop to is not on the same CRZ list as your current. Once getting the right statue you will be transported to the steam pools in Feralas. There you will be faced with, Dormus the Camel-Hoarder, and killing him you will get, Reins of the Grey Riding Camel. as well as a title, and the achievement, Scourer of the Eternal Sands! But you can still share this mount with other people. Have your group members come to you whilst you still got the Dormus' Rage buff and begin realm hopping. As well as each CRZ has it's own Mysterious Camel Figurine each CRZ will have it's own Dormus the Camel-Hoarder. Loot all the mounts with your members near you, they need to be in the same raid to have the same ID otherwise you cannot give them the mount. Finally got mine after 39 fakes! Earliest respawn I had seen was 1 hour 30 minutes ish after I took a fake one. So can confirm their respawn isn't that bad, may seem higher because of cross realm zones however! My tip is get zoned to Pozzo'del Eternita, this realm has no CRZ, got both this camel and Aeonaxx's mount today from there. Also helped a few guildies and friends get since it's tradeable if they're stood near you in Feralas, not sure if intended, but it works and people seem very appreciative! Peculiar story for how I obtained this a while back. I was doing archaeology in Uldum and was pleasantly suprised to find I could create the crawling claw. Little to my knowledge I had skipped out on Cataclysm to do my Exams and I never knew this mount even existed. I knew of the Ramkahen mounts but I was too lazy to even begin rep grinding. I believe it was about 4 In the morning, and after creating my Crawling Claw I turned towards the Obelisk of the Stars and something small hit my cursor, turning it into the "Configure" Cog. I flew over and clicked what seemed to be a small camel in the sand. Suddenly i was teleported to some unfamiliar scenery, I wasn't in Uldum anymore. My Map told me Feralas, I thought this was some kind of joke, I was about to hearthstone when I saw a camel. Not just one camel but HUNDREDS. CAMELS GALORE, Way to many humps to count. So many that Fergie could not even compete. I saw a huge figure in the distance and I had no idea what I was doing here, I ran over to the figure passing lots of camels on the way. "Dormus the Camel-Hoarder". As he was only 5 level's below me, I decided to slay the fiend and release the camels from his grip. After looting I was very suprised to find a mount, also very confused, I had no idea of the power I just received. I had a cool new title and a cool little camel mount that looked FABULOUS, and all my friend's were no longer my friends. I sold my crawling claw for 20,000 and I had many whispers regarding the title. I probably don't deserve this but we all have our "GOT IT FIRST TRY!" story. Got the mount by mistake. Proud owner of this achievement since yesterday (06/13/16). I was searching for the figurines in Uldum and I was about to give up. So I decided to check one more realm before I quit searching. In the south of Uldum I suddenly saw a figurine, my very first one, and guess what? - It sent me to ''The Camel Hoarder'', I killed him and I got my ft of strength, mount and my very cool title! I wish everyone very good luck with farming this mount! Obtain the reins of the Grey Riding Camel from Dormus the Camel-Hoarder. You shall be granted the title "the Camel-Hoarder"